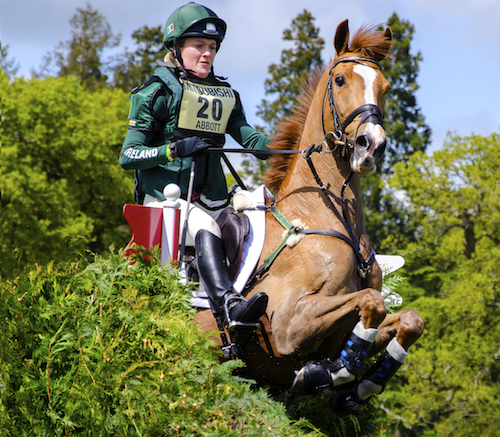 Each May, we endeavor to report on the winner of Worshipful Company of Farriers' Farrier's Prize, presented at the 4-star Badminton Horse Trials in England. Some farriers have won it more than once: Bernie Tidmarsh and Jim Blurton have each won it three times--each with three different horses and riders. Sam Head and Jim Hayter have each won it twice, and Jim Hayter made news by winning it two years in a row with the same rider, Emily Llewellyn, but for two different horses. Rider Mary King has won the award twice. 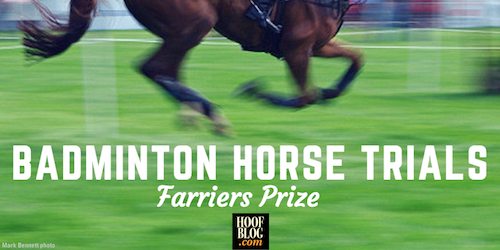 No horse has ever won the prize twice, not even with different riders or different farriers. How many horses complete a grueling event like Badminton more than once in their lives? And Badminton's farrier prize judging requires that the horse make it through to the final show jumping phase in order to be considered for the prize. 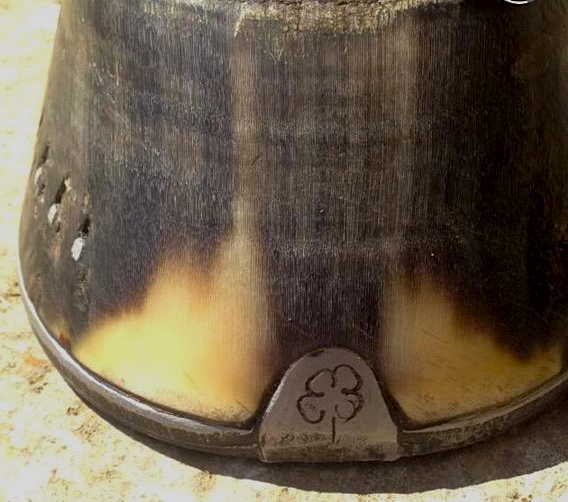 Last year, there was great celebration as the first Irish farrier won the prize for the best-shod winner. Neil Dickson didn't shoe just any horse. He had a lot riding on his work, since the horse, Euro Prince, was ridden by his girlfriend, Clare Abbott. Euro Prince is owned by Cormac McKay. This photo shows Euro Prince's left hind, again handmade from full-crease stock by Neil Dickson. These photos were taken a week after the event, when the shoes had some heavy use on them. It was a great accomplishment for the 12-year-old Irish Sport Horse Euro Prince (a.k.a. "Sparky") and Clare to qualify for Badminton again this year, and to make it through. Two times in a horse's or rider's life would be a thrill. Two years in a row for both together is impressive. 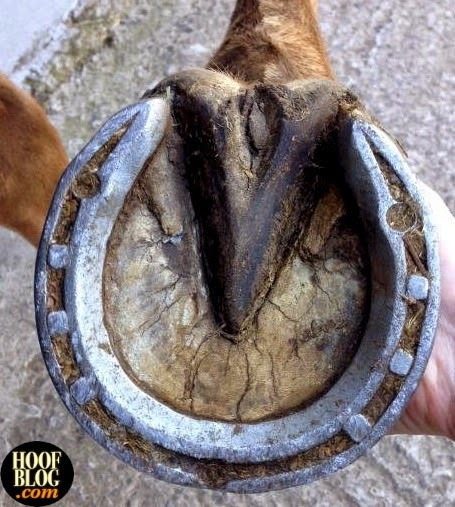 But they went back to Ireland with some extra hardware once again: Sparky's hooves won the Farrier's Prize for the second year in a row, a first in the history of the great Badminton Horse Trials. Neil reported that the year had passed uneventfully for the horse and its hooves. He does minimal knifework on the bottom of the foot, leaving bars and sole pretty much as is. "(I) tidied the bars up but don't like stripping them out completely; to me they are there for a reason so I leave them and plenty of sole for strength...(I) really only use a knife on the sole to relieve any sole pressure from the shoe but most of that can be done by seating the shoe! So, no changes at all, really and still the only shoe he has lost was before Badminton last year." The horse (and Clare Abbott) also represented Ireland at the World Equestrian Games in France in September. Under the heading of "don't mess with success", Neil said that the shoes were pretty much exactly the same pattern and length as last year's set. He timed the shoeing for the Thursday before the horse left for England, or exactly one week before his dressage test. And no, he said, Clare never plugs her stud holes! Australia's Bill Levett flew from riding at Rolex Kentucky to England in time to ride at Badminton. 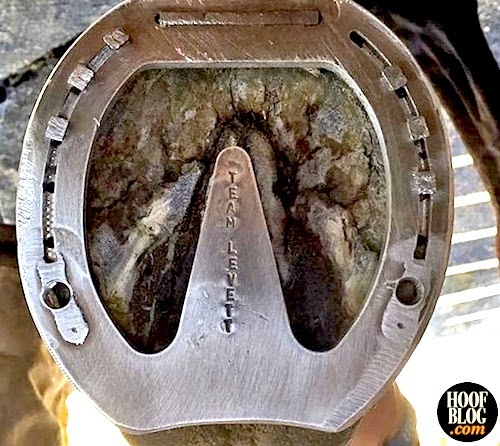 His horse was shod in full-fit heart bars by farrier Nick Deacon, who took this photo...and personalized the shoe for Bill. Do you remember the Jimmy Buffett song, "Nobody Speaks to the Captain"? 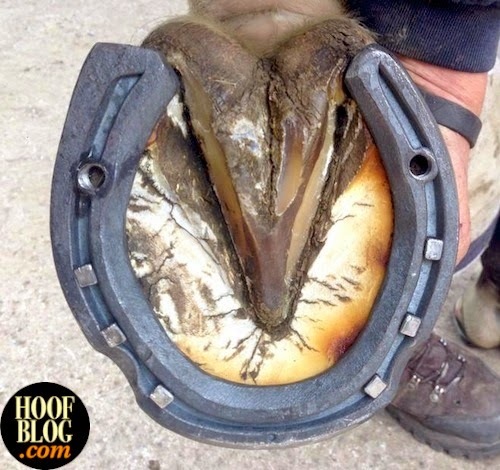 At farrier events, no one feels sorry for the judges. 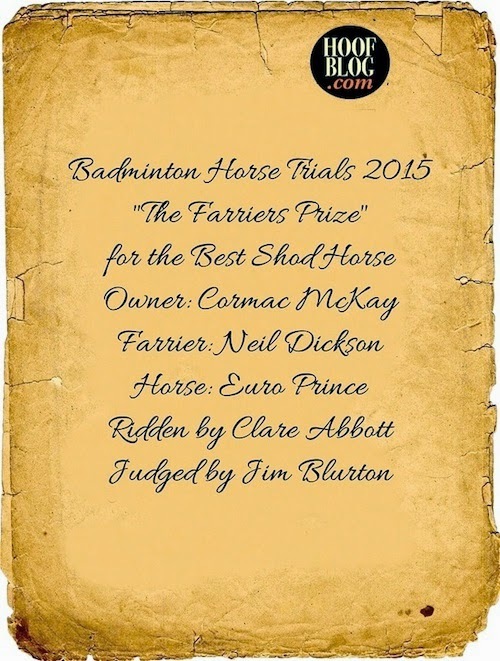 But at Badminton, there's just one judge sent out by the Worshipful Company of Farriers. 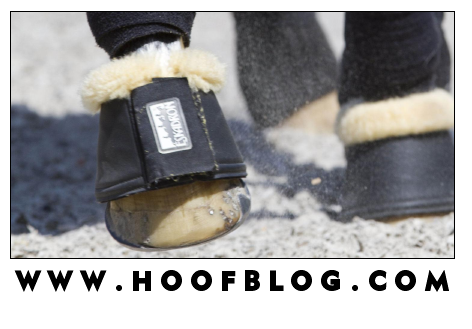 He sets forth with his scribe and has the job of lifting a foot on each of the horses during the Sunday morning horse inspection before show jumping. That's a lot of hooves. 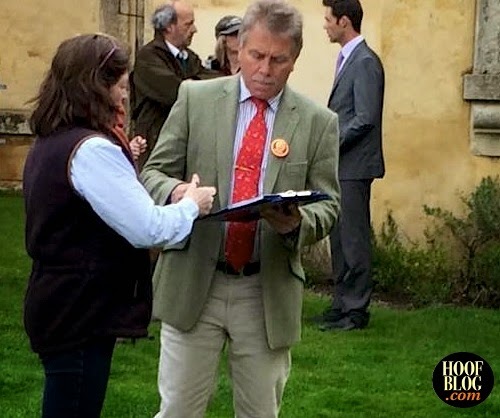 But 2015 judge Jim Blurton of Wales knows what he's looking for, and knows what it takes to shoe a horse for this event. After all, he's won the Farriers Prize at Badminton three times himself and is a former world champion farrier at the Calgary Stampede. 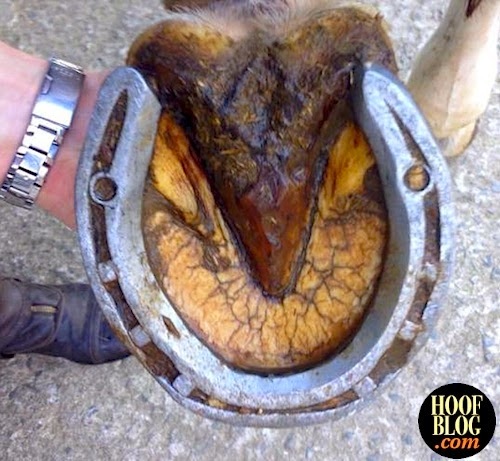 Read the Worshipful Company of Farriers Conditions of Best Shod Horse Awards.